Over the past year, I’ve been enjoying exploring the Eastern Sierras of California. The area encompasses south of Reno NV to LA along highway 395 and the environs. This is a part of California that even many Californians have not visited or know about. It’s a remote vast area with the Sierra Nevada mountains on the west and various mountain ranges on the east. The largest town is Bishop, population of only 3800 at an elevation of 4100 feet. Lone Pine and the Alabama Hills, about 60 miles south of Bishop are another draw. Hundreds of movies were filmed in that area, strewn with huge rounded granite boulders. There are a few other smaller towns for fuel and food. It’s a popular place for fishing and camping in the summer, but the other seasons there isn’t much traffic. There are a few mountain passes open in the summer through the Sierras, but most of them close for the winter with the first major snow. Mammoth Mountain and June Lake area are a major attraction in the winter for Southern California skiers, but they simply pass on through these towns. There are highways into Nevada, too, but again to very remote areas. If I drive a mile off highway 395, my cell phone coverage fades to zero. The night sky is usually wide open and if there are clouds, they are high altitude ones. Rainfall is blocked by the Sierras and most of the area is a near desert. Because of the lack of ambient street and city lights, the Milky Way is clearly visible at night. 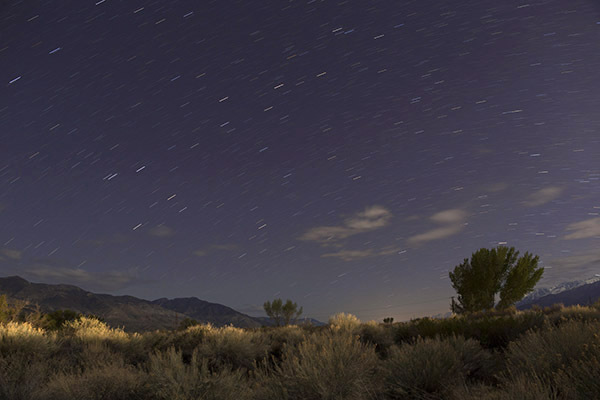 I’ve shot many aspects of the Eastern Sierras, but I’d like to share some of my recent night work. Here is a shot looking east of the snow capped White Mountains with the Sierras behind me out of view. It’s a 15 second exposure. In the distance are headlights of cars on highway 6 heading to Tonopah NV. Highway 6 goes all the way from Bishop CA to Provincetown on Cape Cod, MA. Note the evidence of a meteorite at center left. I typically don’t like to discuss too much about equipment, but recently, I upgraded cameras to the Sony A7RII, selling off some older gear. This camera is of course good to use during the day, but at night it really ‘shines’. It has become my go-to night-shooting digital camera. It’s low light capabilities with little noise is a pleasure to shoot with along with its electronic view finders (both monitor and eyepiece). All of your information is accessible from the view, if you choose. You can customize the camera for specific needs, like night shooting. Digital cameras have come a long way for night shooting in the last dozen years. Here is a similar view done with a different camera about 50 feet away than the previous shot. This exposure is 10 minutes and shows the movement of the clouds, stars and highway lights. I climbed to the top of a bluff off a dirt road you can see in the lower right. I wanted the dirt road as some foreground interest. I had three cameras set up shooting at this location, with the third camera doing a 90 minute night time lapse video. Here is a shot along highway 6 east of Bishop. The light on the brush is from passing cars as I chose to shoot on a bend in the road. I did four exposures until the “light-painting” from the headlights was the way I wanted it. I’ve also purchased a new lens specifically for night shooting, a Rokinon 24mm f1.4. The above (and below) shots are shot with this lens. It is sharp corner to corner with little coma in the stars, even at f1.4, wide open. There have been quality control issues with some copies this lens, but I was lucky and got a good one. Buying from a reputable dealer is important to be able to exchange a problematic lens when there are issues. Here is a 10 minute exposure from the same location and the same lens, but at a much lower ISO of 200. The tones are creamy and smooth in the sky and brush. The shadow detail is excellent, with little noise. This will not be evident at 600 pixels on your monitor, but it is very pleasing on a 24 inch monitor in high resolution. 24mm is my favorite focal length to begin with, so an excellent fast prime lens is a welcome asset to the camera bag. Another benefit is that the cost is about a third the price of the Canon lens equivalent. It’s a manual focus and exposure lens, which is a bit more work for daytime shooting (sort of like shooting with a camera from the 70s), but is fine for night shooting, as I shoot manual at night anyway. In the end, the quality of the glass and the images it makes is my main criteria for choosing a lens. 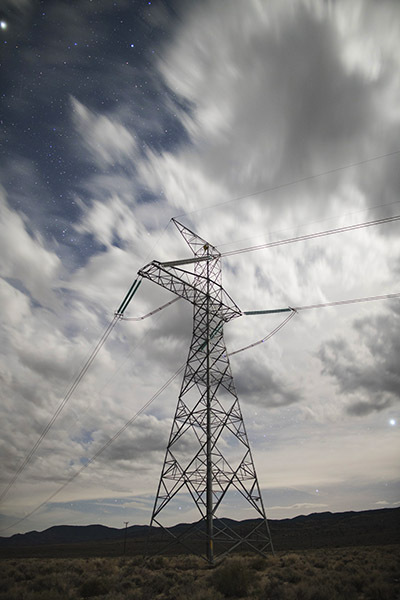 This 15 second exposure of a high tension power line off of highway 395 looks so rock solid with the fast-moving clouds above. There was a quarter moon that night illuminating the clouds. Note how big the two brightest stars appear. This is from the veil-like high altitude clouds that flare the pin-points of light. The stars tell you it’s a night shot, but otherwise, you wouldn’t know. I drove some 30 miles on the dirt road, center left north from Bishop to Benton Hot Springs where I got a room at the only place to stay in town, a B&B. I went back south before sunset to several areas to shoot at night. The above shot is of a lonely ranch. You can barely see the glow of a light from the farm house. There were plenty of barking dogs as I drove by! Again, this is lit from a quarter moon. 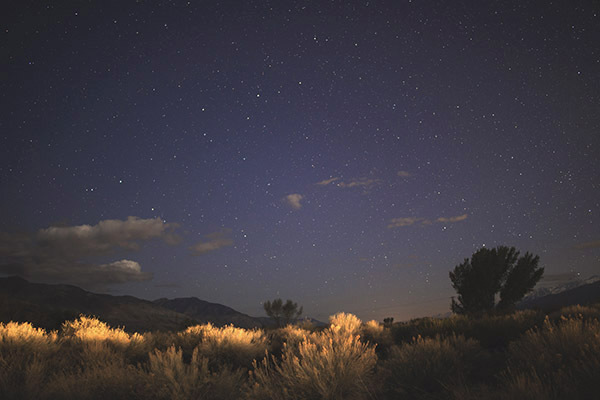 We couldn’t even begin to think about shooting in this low light situation to get pinpoint stars just five years ago. Digital cameras have improved that much since then. This image was actually brighter than what appears here, but I darkened it a bit to make it seem like a night shot, the way I remembered how it actually appeared. I saw this old rusting 1958 Plymouth south of Benton Hot Springs on the way into town and knew I had to photograph it at night. The lights in the background are from an Indian Reservation. Lighting is from a distant security lamp (from the left) and the quarter moon. Here is the local cafe in the town of Benton, population 280, about 3 miles from Benton Hot Springs. Yes, I had dinner at this place, as it was the only place to eat within 30 miles. 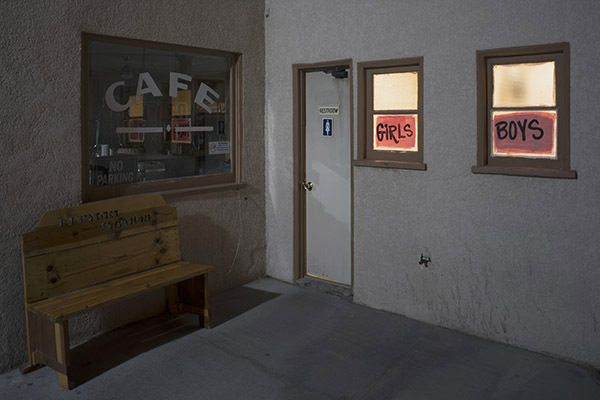 Lighting is from a street light and the interior light of the “Girls and Boys” room. The door was unlocked at nearly midnight. Here is exciting downtown Benton Hot Springs. Hard to believe this was once a thriving mining town of over 5000. The date is painted on the building “Est. 1852”. This is shot with my 28mm shift lens to keep it architecturally correct. I was shooting in the middle of the street for about a half hour and not a car came by. The glow of lights on the road and trees is from the B&B of the left where I stayed. The light on the foreground road and building is from the quarter moon coming through the clouds. There was no detail to the eye on the items on the porch. The outdoor natural hot springs baths was a great way to relax after a night of shooting and to clean off the desert dust. Nice shots and great writing and discussion. Thanks. Been too long since I’ve gotten to the eastern Sierra. Thanks for commenting. I remember you from a Bodie trip, so I know you know the area somewhat. 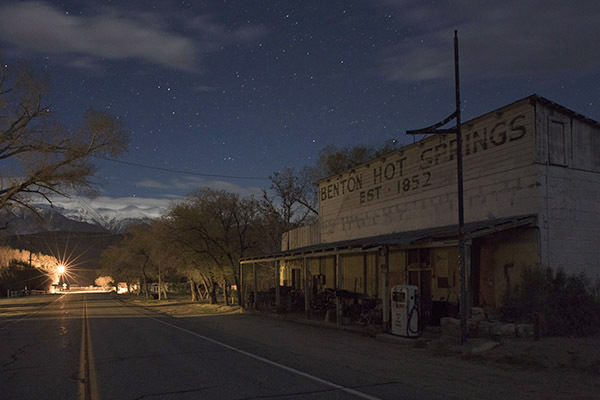 Benton is only 40 miles from Bodie, with some great back country dirt roads between them. Look forward to seeing you again sometime. Nice stuff as always and a pleasure to see the west this way. Any chance of a show in LA anytime? Good to hear from you. 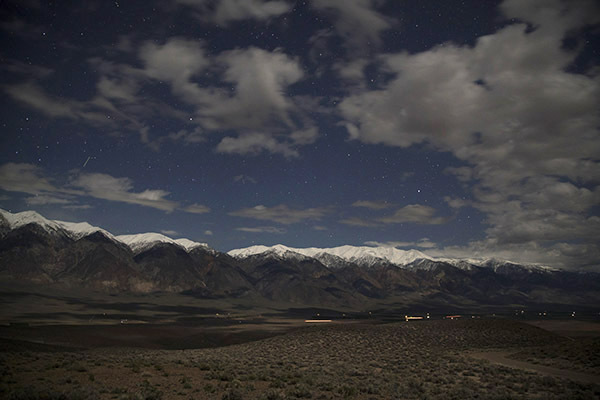 The Eastern Sierra is a forgotten or unknown part of CA. Thanks what I love about it. Sorry, no shows in the pipeline at this time, but you’ll hear about it in the blog if I do. Wow, very beautiful and so serene. You can hear the silence. wow great stuff. you shoud try the eastern sierra in the fall when the leaves change color! BTW sierra is plural. calling it the Sierras is ungramattical. Many thanks. Yes, I’ve been up in the Eastern Sierra in the fall and it’s gorgeous. The winter has its charm, too, and there is no one up there except the long distance truckers or skiers heading to Mammoth. You’re not the first to notice the “s” on the end of Sierra. My typo. The other folks who noticed were writers, too! Excellent images, Tom. That last item reminded me of the founding company of the Nautilus family, California Stevedore & Ballast Company, also founded during the Gold Rush in San Francisco in 1852. Is there anything left from the early era of the Nautilus family? That might be something to explore… Thanks for commenting and good to hear from you. 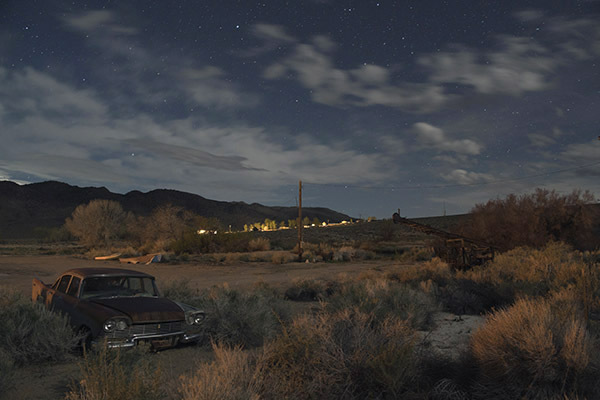 Bodie at night is special, but as you can see there are many other places to shoot up there, too. The shots along highway 6 are about 40 miles from Bodie, with many back country dirt roads between them. Thanks for commenting. Tom, Very very cool. Love that area! Always know I am getting close to start my day skiing in Mammoth as I pass by……well done! Angelinos know the Eastern Sierra because of Mammoth. There are lots of other things to see between here and Reno. You should check it out sometime. Take your bike up there in the summer and explore. Love the pics and that part of California. That Roc 24 was worth every penny. Nice lens. 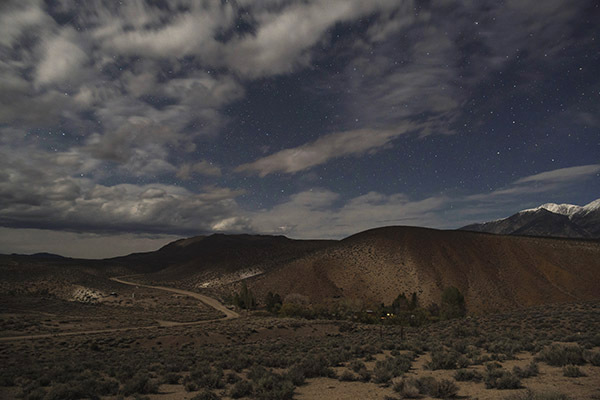 I also love the Eastern Sierra for its remoteness and find it very relaxing yet inspiring. When we get together, I’ll show you the lens and let you shoot with it. What, no hot springs pics? The hot springs were a series of concrete “hot tubs” fed my natural hot springs. I went in one at 2am after shooting. There was no one around and I could sit and look up at the millions of stars. The spa was comforting but not photogenic. Mesmerizing as always your night vision and the text that describes your shooting, where the light comes from, this is really meditative, where light comes from. You understand light and what it can do. I do, too, and use it in my work for drama. Thanks for your comments. There is a charm for the old and forgotten. Photographing it at night makes it dramatic and mysterious. There at the ICTF, night images makes for drama, too. Really like the shot with the ’58 Plymouth. 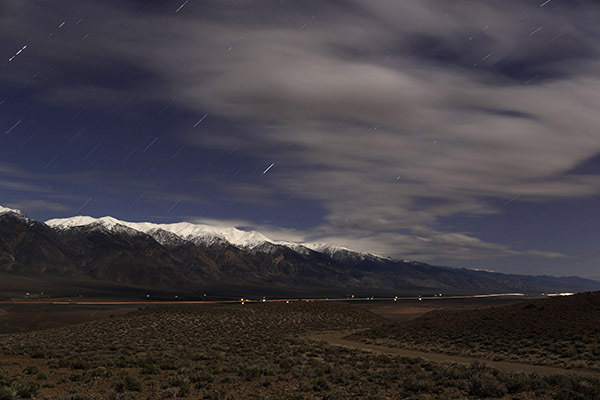 I love the Eastern Sierra, because of its remoteness and isolation, especially in the winter. Yet it’s close enough to get to in a few hours for Angelinos. Take a side road, turn off the cell phone and see what happens. Much appreciated! The variety of effects due to different exposures is remarkable. BTW, I like discussions of equipment! Different techniques for different looks. As they say, “You pay your money and you take your choice”. Another great trip, Tom! Amazing how the range of digital night photography continues to improve. I imagine in a few years, we will be able to take a shot at f/8, 1/1000 and get all the detail that we would get in a daytime shot. It will require a whole new way of looking at and assessing the artistic potential of a scene. Yes, the technology improves, but as my talk to your photo club showed, photographers have been shooting at night for a long time. Just because it becomes easier, doesn’t me we should or shouldn’t shoot. Look forward to seeing you again, soon. I envy everybody who lives in the west. It has more beautiful parks and landscape than the East. As usual your images are great, specially the top of the shrubs getting lighted by the passing car and the High tension power line. Yes, I do love the west, even though I often shoot elsewhere. Thanks for the comments. You’re right, Tom – I’ve never been. Different from the Sierra Foothills where I live (as you know). Might have to go to check it out this summer. Thanks for pix. Yes, check out the Eastern Sierra. It’s not that far from you. See you soon. Thanks and appreciate that you look at the work.